• sustainability; • inclusivity and respect for diversity; and • respectfulness and teamwork between the College Council, staff and stakeholder community, each respecting the other's role. VALUES The Ontario College of Teachers commits to: • protect the public interest; • quality, excellence and professionalism; • honesty and integrity; • accountability and transparency; • efficiency, effectiveness and fiscal responsibility; OBJECTS The College has a duty to serve and protect the public interest by carrying out the following objects in the Ontario College of Teachers Act: • regulate and govern Ontario teachers; • determine requirements for College membership; • accredit professional teacher education and development programs, and provide for members' ongoing education; • develop, provide and accredit programs leading to additional Certificates of Qualification; • issue, renew, amend, suspend, cancel, revoke and reinstate Certificates of Qualification and Registration; • set and enforce professional and ethical standards for College members; • investigate and resolve complaints against College members regarding allegations of professional misconduct, incompetence and fitness to practice; and • communicate with the public on behalf of College members. STRATEGIC PRIORITIES 1. 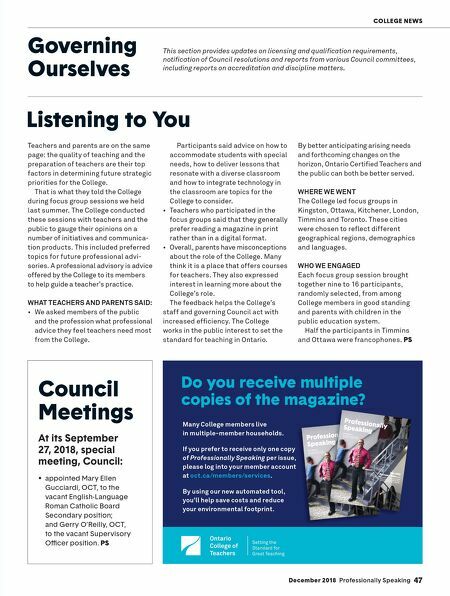 Broaden membership engagement in the work of the College, and in particular, engage members in non-traditional settings, including retired teachers, and First Nations, Métis and Inuit teachers. 2. Develop strategies to facilitate the ongoing professional learning of members. 3. Develop a comprehensive, long-term communication plan that includes other regulators and leverages the College's website and other communication vehicles to: • inform the public about the objectives and processes of self-regulation; • develop, among the public, an appreciation of the value of self-regulation; and • improve the transparency of the College. 4. Enhance Council and committee effectiveness and accountability through: • professional development on good governance; • clarification of the appropriate roles of Council members and staff; • streamlining and improving Council's processes; • identification, review and improvement of committee practices; • implementation of formal accountability; • measurements; and • periodic third-party review. VISION To be trusted to regulate the teaching profession. 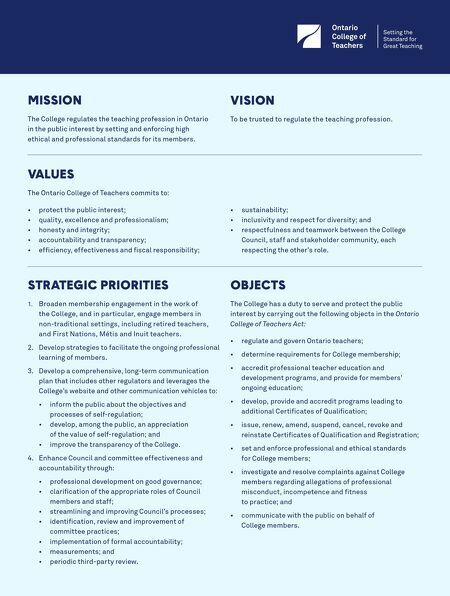 MISSION The College regulates the teaching profession in Ontario in the public interest by setting and enforcing high ethical and professional standards for its members.